Putting players in the shoes of a forensic investigator, Crime Scene is a five row, three line slot with 15 pre-set paylines and a theoretical return to player percentage of 96.7%. Amongst its features the game includes sticky wilds and a fun bonus game, and also allows players to control their betting by choosing between ten bet levels and seven coin values. With a theme that builds upon people’s fondness for murder mystery and cop shows, Crime Scene is an interesting and yet relative simple slots game. Below you will find brief details of its top jackpot payouts, special symbols and bonus game, overall paytable and betting limits. Coins can be won through the Crime Scene slot in a couple of different ways. The main way is by achieving winning combinations of symbols across the game’s 15 pre-set paylines. Five identical symbols consecutively from left to right along the paylines are the top combinations, and the most valuable of all those combinations pays 750 times the bet level. As well as those types of win, Crime Scene’s bonus game also allows for further payouts with the maximum value of winnings from the bonus game equalling 6180 coins. The overall maximum win from Crime Scene equals 22500 coins, which at the highest coin value of £1.00 equates to a £22500 payout. 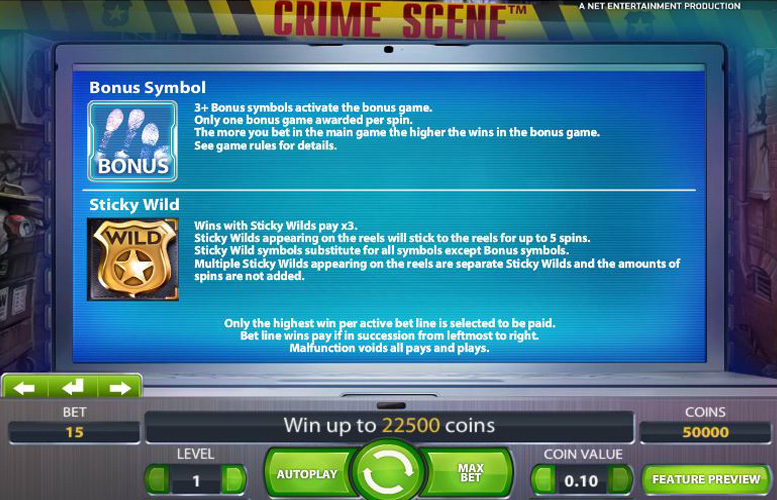 There are only two special symbols present in the Crime Scene slot in the shape of the sticky wild symbol and the bonus game symbol, but both have interesting and potentially very beneficial functions. The sticky wild can appear at random across any reel, substitutes for all other symbols barring the bonus game symbol, multiplies winnings by three and sticks to the reels for up to five spins according to the number displayed on the symbol. Only one sticky wild multiplier is applied per bet line win, the symbol always pays the highest winning combination possible and two or more appearing at once act as one single sticky wild – the number of spins shown on the symbols are not added together. If a player’s spin reveals three or more successive bonus game symbols from left to right on a payline, the bonus game is activated. During that game the player must click on folders to reveal either coin win values or ‘action symbols’. Those symbols all have different functions which can be found on the game’s paytable. The more a player bets in the main game, the higher the potential wins in the bonus game and at the end of the game they must choose between four envelopes. In one envelope is a multiplier that doubles the total bonus game winnings, but the maximum win for the bonus game is capped at 6180 coins. The symbols of the Crime Scene slot are all themed around the scene of a crime and the subsequent forensic investigation. The most valuable winning combinations across the game’s 15 paylines are those with five consecutive identical symbols from left to right. The biggest possible payline win results when five of the bloody footprint symbols line up and that combination pays 750 times the bet level. At the highest bet level of ten and the top coin value of £1 therefore, that means a potential payout worth £7500. The next most valuable symbol within the game is the safety goggles symbol which pays out 400 times, and as mentioned earlier the maximum coin win for the entire game is 22,500 coins. Players of the Crime Scene slot can take charge of the amount they bet per spin by setting both the coin value and the bet level for each spin. There are seven different coin values from 1p to £1.00 and choosing between bet levels from 1-10 dictates how many coins are bet per line. At the lowest coin value of 1p and lowest bet level of one therefore, a player would wager a total of 15p whilst if they chose the highest two settings of £1.00 and level ten they would stake the maximum £150. 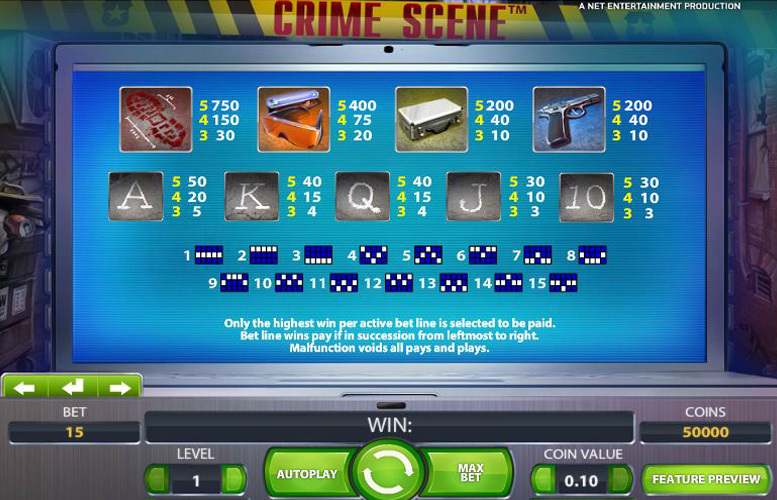 Crime Scene is a slot which sits in the middle ground when it comes to both gameplay features and potential winnings, and as such is likely to be popular with a vast array of potential players. The slot is a very simple one to grasp and to play but does still have an interesting bonus game and fun sticky wild symbols that set it apart from the most basic of slot games. That bonus game is not the most innovative or exciting around however, but does add to the potentially very valuable winnings which the game can provide. Depending upon the bet amount that the player sets after all – over which they have a very good level of control – a player can win up to a maximum of £22500 and the game’s single most valuable payline combination can be worth a lofty £7500. 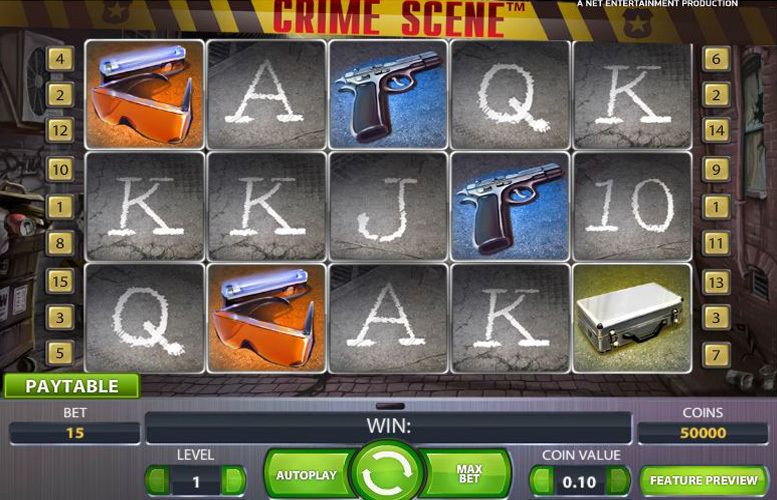 If a player is looking for a fun slot that they can pick up quickly and potentially enjoy a good payout from therefore, Crime Scene may be the game for them. This game has a rating of 3 / 5 with 223 total reviews by the users.